Gabe is sharing the easy way to make one of our favorite lawn games that you can bust out for the Fourth of July or all summer long! Pole-ish Horseshoes (also known as Beers-bee) is the easiest lawn game to make and most inexpensive. You will find many different variations of the rules as well as PVC height and thickness. What I’ll be sharing with you is not anything official, simply the Liesemeyer house rules that my family and friends have used for years. 2 lengths of 10 ft PVC pipe (thickness should be no thinner than “Schedule 40”) with a 11/2 in. width. I prefer to use a 11/2 width pipe as it has more “play”, or give, in the pole while playing the game. Others prefer to go with the stiffer pole offered by using a 2in wide PVC. Cut both lengths of PVC to a height of roughly 6 feet. (We prefer our poles at 6’3”). Next, make an angled cut that starts at the bottom of your PVC and ends roughly 11/2in above the bottom. (See picture for example.) Do this for both PVC pipes. Wrap a thin piece of electrical tape or duct tape 11/2ft from the bottom of your pipe. Place a glass bottle on top of each pole. Pole-ish Horseshoes is a game that requires two 2 person teams. One team stands together at one pole, with their opponents standing together at the opposite pole. The object of the game is to score 21 points before your opponent. 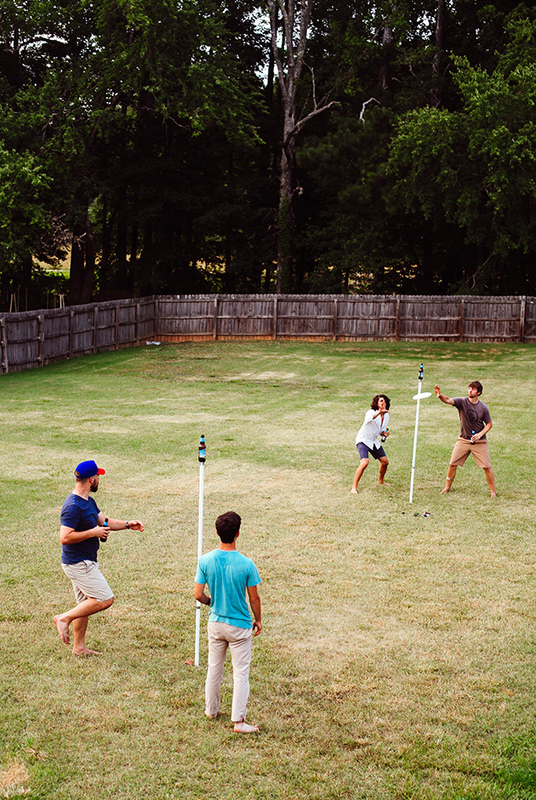 The game is played by standing next to (or behind) your pole and throwing the frisbee at your opponents’ pole/bottle in an attempt knock the bottle to the ground. Your opponent’s goal while on defence is to prevent both the bottle and frisbee from hitting the ground without blocking the pole or interfering/catching the frisbee in front of the pole. If interference is called, 3 points will be awarded to the throwing team. If the bottle falls as a result of a frisbee throw and is not caught by a defender before hitting the ground, the throwing team is awarded 3 points. If the frisbee hits the ground after striking the bottle or the pole, or from a defender failing to catch a catchable throw, the throwing team is awarded 1 point. (A word of advice, establish what a “catchable” throw is with all players before playing.) If the frisbee is thrown and strikes the pole below the tape line, the throw is considered a miss and no points are awarded, even if the bottle and (or) frisbee hit the ground. After your team throws, the opposing team will throw, giving your team the role of defending your pole. Be sure to follow the same order of throwers, for example: you, your opponent, your partner, your opponent’s partner, repeat. Last but not least, Liesemeyer House Rules stipulate that you must have a beverage in one hand at all times (said beverage does not need to be alcoholic). The reason for this is it adds an extra layer of fun as it requires all people to play one handed. In addition, the spillage of any beverage during play (even a small splash out of the container) results in a penalty of two points being awarded to the other team. We hope you get a chance to give this a try and enjoy this holiday!